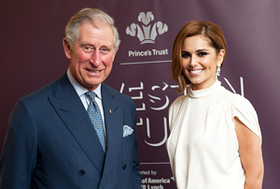 Prince Charles was joined by Cheryl Cole, Jools Holland, Lulu, Michael McIntyre and Alison Moyet to raise vital funds for The Prince's Trust last week, at one of the most important fundraising events in The Prince’s Trust calendar. The annual Invest in Futures Gala Dinner, supported by Bank of America Merrill Lynch, took place at The Savoy and saw the financial community demonstrate its support for more than a million unemployed young people in the UK today, raising £1 million for The Trust. Cheryl Cole appeared on stage with Michael McIntyre to announce one of the exclusive auction lots during the charity dinner – an afternoon tea for four with Ms Cole at a top London hotel. The singer set up The Cheryl Cole Foundation last year, helping support The Prince’s Trust and disadvantaged young people in the North East. The afternoon tea with Cheryl was auctioned for £30,000, the highest live auction bid of the night. Hosted by comedian Michael McIntyre and with entertainment provided by Jools Holland and his Rhythm & Blues Orchestra, Lulu and Alison Moyet, the Invest in Futures Gala Dinner was attended by hedge fund leaders and global financers from across the globe, uniting the financial services industry to invest in disadvantaged young people, helping them become economically active. Other celebrity supporters of The Prince’s Trust pledged their support by offering auction lots including a trip to the American Idol Finale in LA and a day behind the scenes at the Downton Abbey set. Dame Helen Mirren donated an evening dress which she wore to the Nobel Peace Concert in Oslo and Sir Peter Blake pledged a limited edition signed piece of artwork. A dinner for 12 with Emilia Fox and a lithograph created and signed by the youth charity’s founder and president, HRH The Prince of Wales, was also auctioned off for the good cause.